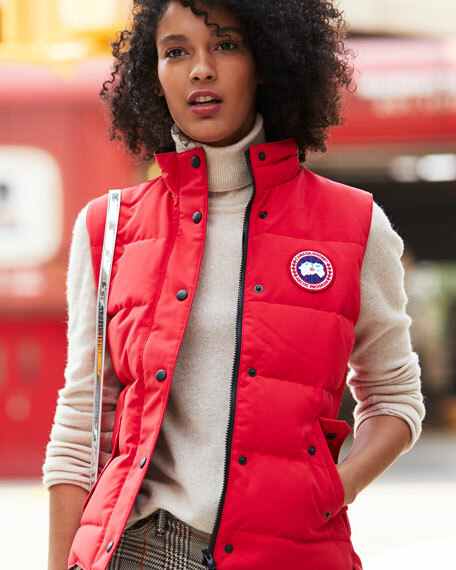 Water-resistant, quilted tech Canada Goose vest with logo patch at left chest; 625 fill power. Stand collar; snap placket/one-way zip front; Canada Goose ribbon zipper pull. Envelope adhesive pockets; inner Napoleon adhesive pocket at chest. For in-store inquiries, use sku #138741. Brunello Cucinelli vest in dyed and natural mink fur (Denmark). Striped, banded collar and hem. Two-way zip front. Full shoulder coverage. Side pockets. Relaxed fit. Lining, acetate/silk. Made in Italy. Model's measurements: Height 5'11"/180cm, bust 32"/81cm, waist 25"/64cm, hips 36"/91cm, dress size US 2/4. EXCLUSIVELY AT NEIMAN MARCUS Gorski horizontal-quilted puffer vest with down fill. Hood with detachable dyed SAGA?? superb fox fur (Finland) trim. Zip front; concealed placket. Side slip pockets. Semi-fitted. Hip-length. Nylon/polyurethane. Made in Italy. Model's measurements: Height 5'10"/177cm, bust 33"/84cm, waist 25.6"/65.2cm, hips 35.8"/91cm, dress size US 2-4/FR 34-36. Norma Kamali "Sleeping Bag" vest in abstract swirl motif. Notched lapels; open front. Detachable self-tie belt. Side pockets. Relaxed fit. Norma Kamali "Sleeping Bag" vest in abstract swirl motif. Notched lapels; open front. Detachable self-tie belt. Side pockets. Relaxed fit. Nylon/spandex; polyester fill. Imported. Model's measurements: Height 5'9" / 175cm, bust 32" / 81cm, waist 23" / 58cm, hips 34.5" / 88cm, dress size US 0/2.